This was hilarious, reminds me of my 9th grade speech class. Everyone is so awkward and trying so hard to be relevant. Sometimes I miss out on the message because I've gotten sick of the messenger, and so a sort of highlight reel mashup exposes me to more of the content that I'm actually looking for than I might otherwise seek out. I therefore greatly appreciate the host's sourcing and splicing. The approach to issues is honest, yet relatively broad, comprehensive, and humble; arguments are contextualized; sound clips are sourced from a range of independent media; sensitive topics are fleshed out; there are no financial interests pushing the narrative in one way or another on the whole. I also appreciate the way in which Jay gives listeners of the show a platform as well (through voicemail). Kudos to my comrade Jay and his supporters. Bruce Bartlett really setting himself up for a presidential run in 2020. I rarely miss and episode. Jay does a great job of compiling many left sources that all relate to the current topic of the show. Most of them are very relevant to politics in the moment. I am currently really enjoying the candidate spotlight episode. I would LOVE to listen to many more of these. Since the mainstream media thinks centerist views qualify as liberal (I'm looking at you, NPR. ), Best of the Left is breath of fresh air. Jay puts in an insane amount of work to bring a show that consistantly makes you think and keeps me buoyed up in these trying times. I subcribe to the podcast through Patreon which is well worth the cost every month for the additional content you get. Jay has turned me on to so many progressive shows! Thanks for all the work that you do! Informative podcast with good content from various left shows, but Jay’s voice is grating. His pronunciations makes it sound like a snail lives in his mouth. Quite annoying. Quit eating a snail! This podcast is representative of the Liberal agenda to remake America into a Socialistic/Communistic society. I love this podcast. This is not simply a recap of Trump blunders, but rather a deep dive on the big ideas of our time - socialism, Article 5, Dark Money in Politcs, inequality, etc. Really good stuff. Love the link system for social.media sharing too. Thanks! This aggregate of several progressive podcasts/broadcasts is a great way to stay informed on new ideas, policy positions and current politics concerning issues important to progressives and liberals. I also enjoy the question/answer segment at the end of the podcast. Thank you! This is a great way to get an all around listen to what the left is talking about. Jay does all the work for us! Then all we have to do is listen and do what's right. Good content with lots of commentators on a single topic. Unfortunately, many guests are all gloom and doom. I wish they would introduce guests and have longer interviews. Also, podcast has occasional weird musical interludes for no reason. Keep up the good work, J ! This podcast is a very well selected set of chunks of radio programs that I love listening when I get time to do so. Awesome collection ! It is the Voice of the Silenced Majority. Just feel irritable from listening to them dance around topics. Single payer = using someone else’s money to buy something for someone else. It goes against logical reasoning of making something better. It makes a worse product or service more expensive. Not more expensive to the person receiving the service or product... unless they pay taxes! Terrifically useful compendiums of Left throught. My only quibble is that the speakers are not identified until the end of the episode. Would be so helpful if the description had a list. Jay, thanks again! Here's me listening to your horrible/wonderful podcast: Discouraged, hopeful, encouraged, hopeless, giddy, deflated, depressed, invigorated, satiated and starving. As I write this quick appreciation from Gilbert, AZ suffering a 25 year drought, my door is open to a quenching light rain after several months of no precip at all. For a few minutes at least, I've chosen to deny climate and embrace weather! I'll be spreading links to your show and this episode in particular. Your work does not go unnoticed. Thank you for the rain- if only to rinse the salty tear streaks from my face after gorging on the smorgasbord of clips relating to our treatment of the most vulnerable huddled masses of humanity that present at our shores. Special note to the very fine N-word president haters who've stumbled here: There is much joy for you also to foam over within this episode because truth is often ugly and shameful. Jay is doing some of the most important journalistic work of the day. How do you access subjects that need in-depth and nuanced attention in a society that has an attention deficit? Jay has found a way. I love this podcast and it has led me to many other sources that I also love. Bravo. This is the best the Left has to offer? This explains so much. Good, but consistently leaves me wanting. Best of the Left consistently pulls interesting clips from a (fairly) broad list of sources that is entertaining and raises some worthwhile points. I can expect to leave the show with a witty one-liner and something worth thinking about if not discussing, so I had high hopes for the show. However, these clips invariably cut out any data behind their reasoning. It could be that this is just too cumbersome for a show more focused on entertaining, but it's very difficult for me to take a show seriously that repeatedly makes claims about broad topics without citing where the information comes from, or at least why we should find their argument compelling. This show began to feel like a bitter echo chamber, so I will be searching elsewhere for my news and political updates. The work that goes into curating this podcast, culling the best discussions on a theme from multiple sources, is huge. And they make it seamless. I am a political junkie and this is in my top 5 I listen to weekly. I learn a lot - everytime. Thank you for your excellent work. Show does a great job of compiling a number of programs into an excellently themed show. I have been listening to Jays podcast for years and appreciate all the hard work he puts into making a brief coverage of current topics. 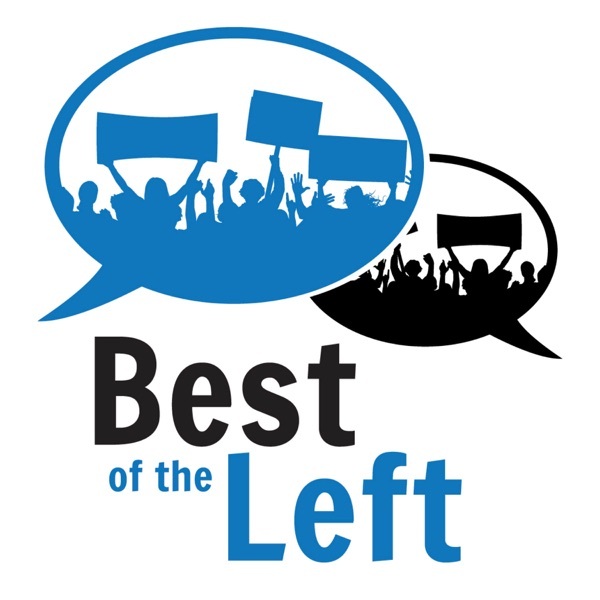 If you want to get right to the meat and potatoes of the left and center leaning media, listen to Best of the Left podcast and stay up to date on topics of interest. The “host” of the show does some vocal fry thing that will make you involuntarily start making fun of him in the car. Seriously, I like this show. But when the choice comes to press play, I have to decide if I can take the pain of the host’s voice. Jay brings together lots of great clips across from mainstream and progressive outlets that give a representative picture of what most reasonable, well-informed, open-minded people should know, think about and ACT on. plus he gives a well-reasoned response to many counter arguments that come in over the transom. Not only is Best of the Left one of the rare podcasts expressing a more leftist politic, it also covers more topics in more depth than the dozens of liberal/centrist podcasts I listen to regularly. Such a great resource to those of us growing increasingly frustrated at the Democrats' progressive entrenchment in neo-liberalism in such an era. One stop " shopping" program for progressive news and information. Keep up great work. Honestly, if this is the best of the left, the left is going to die very soon. Some of these guys are actually really logical and make sense. Others are just throwing insults left and right and claiming to be smart. It is an awful Collection. This podcast is so well produced. As a progressive guy, I appreciate an informative podcast with great ideas and not just party pooping. You can tell that a lot of hard work goes into each episode. I learn at least one new thing each time I listen. Keep up the good work! Jay (show creator) puts enormous effort in this podcast and the quality is evident with every episode. Jay does not shy away from shining a probing light on sometimes clearly controversial and nuanced subjects. I have been a listener and subscriber since 2012. This is however the first time I am submitting a review. Keep up the good work Jay & team. You all make the podcast incredibly informative and worth the time to listen to. I like hearing what different programs have to say on a subject. Jay! 's curation of progressive media is always a welcome respite of sanity from the usual rot that pervades. Too left. Alt left to me. Done. Constant whining about what isn't "FAIR." Hey you entitelist idiots, life isn't fair. The Declariation of Independance guarantees Life, Liberty and the PERSUIT of happiness. It does not garantee happiness. Socialist/communists think happiness is a right, IT IS NOT A RIGHT.